Perfect woman Eva was born on 1976-08-28 and her star sign is Virgo. These people are real thinkers; having a quick and keen perception. 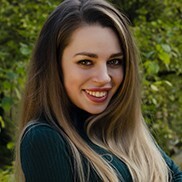 If you are dating russian girl of this sign, mind her constructive ideas and sound advice, because Virgo's gift gives her a deep understanding of human nature. Travel is great passion of Virgo people and they will fare well in careers that take them away from their home land.There is ingenuity around this sign, a kind-heartedness, which unfortunately is sometimes played upon by others for their advantage. Virgos can often become victims of relationship power-games, where they are mistreated.